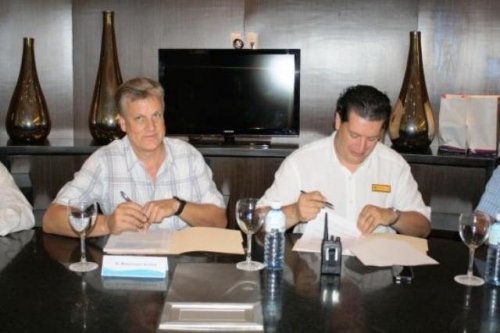 Now Amber Puerto Vallarta recently joined the collaboration agreement between the University Centro de la Costa de Guadalajara and AMResorts to help develop sustainable tourism in Puerto Vallarta and Banderas Bay. The cooperation agreement states that the university will offer advice and guidance to hotel staff to help create environmental initiatives to keep tourism sustainable in Puerto Vallarta. The University de la Costa has a Center for Sustainable Tourism Development and maintains an active role in environmental development in the area including the rescue effort of the El Salado Estuary. The General Manager of Now Amber, Mauricio Martinez, emphasized the common interests between AMResorts and the university to start together a series of programs for local people to preserve biodiversity, reduction or recycling of waste resources, and sustainable use of natural resources in the region of Banderas Bay. This entry was posted in Now Amber and tagged Mexico, Puerto Vallarta, Sustainable Tourism Project, University Centro de la Costa de Guadalajara. Bookmark the permalink.